Hey Renee – love the flamingos! On the yoke: we have had quite a lot of people trace the wrong size lines on the back side piece (it’s nested slightly differently than pieces sometimes are) – the correct size pieces should match up correctly. Might be worth re checking that piece! I just re measured because I was feeling a bit paranoid! 🙂 The 12 yoke (half is 7.16 inches across at the seamline. The 12 side back is 4.47, and the center back is 3.66; they have a seam between them, so the lower half is 4.47+3.66 – 1 = 7.14 inches. So it’s out by 0.02 inches, which shouldn’t be noticeable (and is within the tolerance of measuring error). That makes me suspect maybe the tracing error I suggested is what happened? Your paranoia is undeserved! I went back after reading your note. Yes, I traced correctly. But, and this is a big but, I flipped the center back piece and had it upside down despite having sewn it FIVE TIMES. That makes up for the one inch difference I found. And, seemingly the catalyst for all my other fit issues. I’m editing my post now to reflect my mistake and will muslin this again with the your correct draft. The flamingos are wonderful! All that effort was certainly worth it. And – exercising aside – it is recommended to measure yourself at least every year if not more often. Our bodies do weird things and change of their own volition. Congrats on adjusting your way to a TNT shirt pattern. Your flamingos are going to have competition with other fine fabrics now. I absolutely enjoyed reading this review. It felt like I received REAL information. It’s often the simple garments that teach us the most about fit. 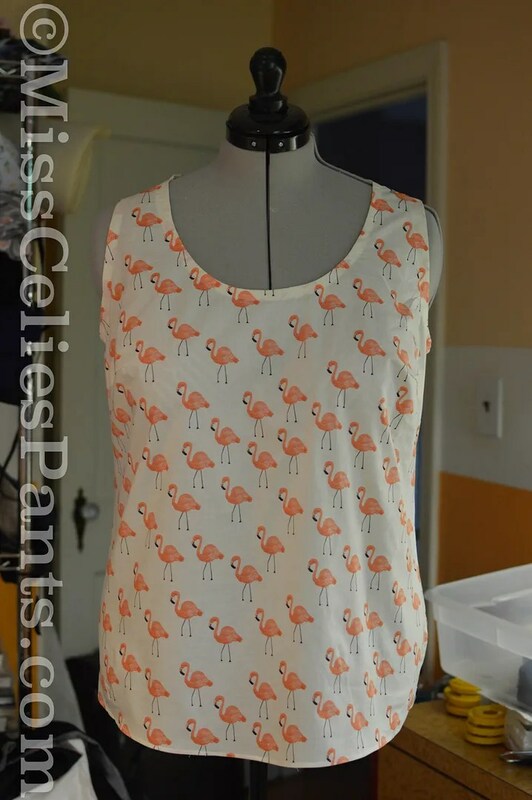 Love your flamingo top, so worth the effort! I had the same problem with the yoke, hips, and dart placement! Unfortunately I don’t have your sewing experience, so I just gave up and put the pattern away. After reading your post, I am going to give it another try! I always blame myself when garments don’t turn out right, so I appreciate you sharing your experience. I feel motivated to keep trying! I used to regularly ignore darts that were too high, lol! But, have finally accepted that I just have a low bust point. Definitely give it another try. After Jenny commented above, I went back and looked at the pattern. Even though I traced it several times in multiple sizes AND sewed it a total of five times, I made a mistake in construction that resulted in it being too tight across the back. It looks like the Cashmerette draft is accurate and I made a mistake.